1. Directgov should be the default platform for information and transactional services, enabling all government transactions to be carried out via digital channels by 2015 ... must focus on creating high-quality user-friendly transactions ... scaling back on non-core activities. 2. 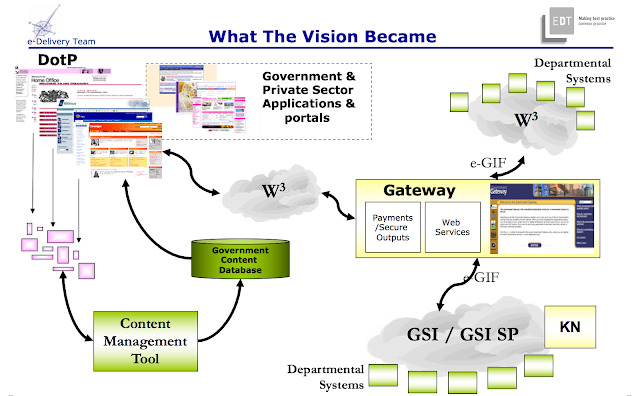 Realign all Government Delivery under a single web domain name ... accelerate the move to shared web services. 3. Learn from what has been proven to work well elsewhere on the web ... focus on user-driven and transparent ... implement a kill or cure policy to reduce poorly performing content. 4. 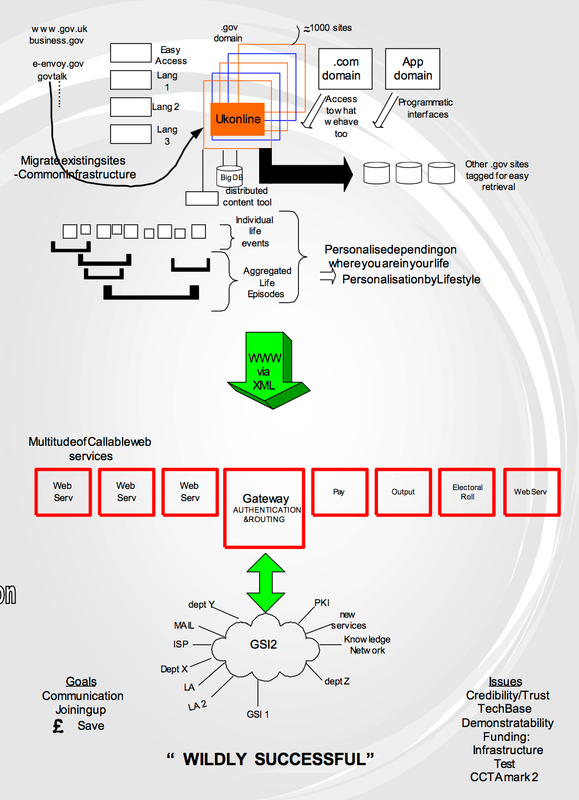 Mandate the creation of APIs to allow 3rd parties to present content and transactions. 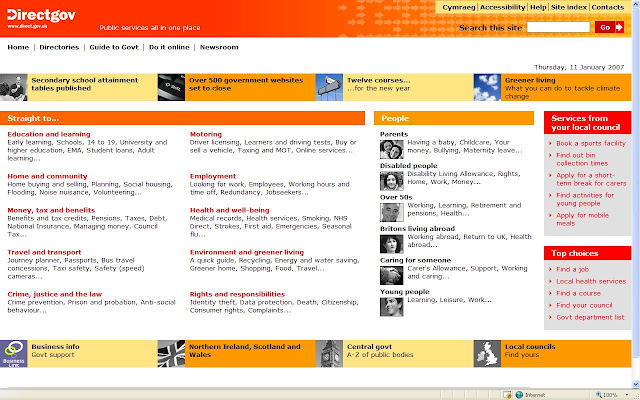 Shift from "public services all in one place" to government services "wherever you are"
Now, nearly 7 years after Martha's report, we have a new flagship website (whilst Martha's report was strong on making use of the direct.gov brand name, given the investment in it over the previous 6 or so years, a decision was made to use a different brand - you'll see that we had suggested that as a possible name in the 2001 picture above; it's in the very top left). Thirteen years of user needs, iteration, at least three different content management tools and, branding and size of search bar aside, do you notice any major difference? Nope, me either. Interestingly and both encouragingly (because admitting the problem is the first step to solving it) and depressingly (because it's not like there haven't been plenty of opportunities before) GDS, after I'd written this post but before I'd published it, have noticed the problem too and seem, at last, to be taking recommendation 3, "kill or cure", to heart. When we envisaged the second iteration of UKonline.gov.uk (the first was run under a contract let to BT and was run by CITU, before OeE was really in existence, though it did go live on OeE's watch), we saw it as a way to join up important content across government, creating a veneer that would buy time for the real engineering join up to take place behind the scenes - something that would result in joined up transactions and a truly citizen-centered approach to government. Life events - important interactions with government - were synthesized from across all departments and brought together, by skilled content writers, in a way that meant the user didn't need to traverse multiple government websites - the aim was to give them everything in one place. 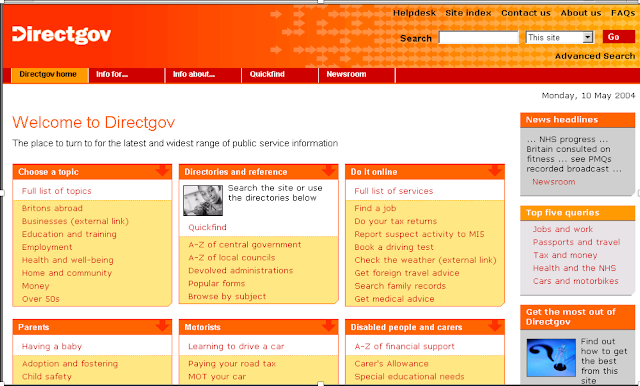 We (OeE as a whole) continued that approach through successive iterations of UKonline and on into its successor, direct.gov.uk (which started life as the Online Government Store, or OGS - a shopfront where all of government content could be accessed). Thirteen years after the launch of direct.gov.uk, it looks like there have been successive iterations of that approach along with a wholesale migration of much of government's content to a single platform. But there hasn't been any of the real heavy lifting done to join up the content and the transactions. 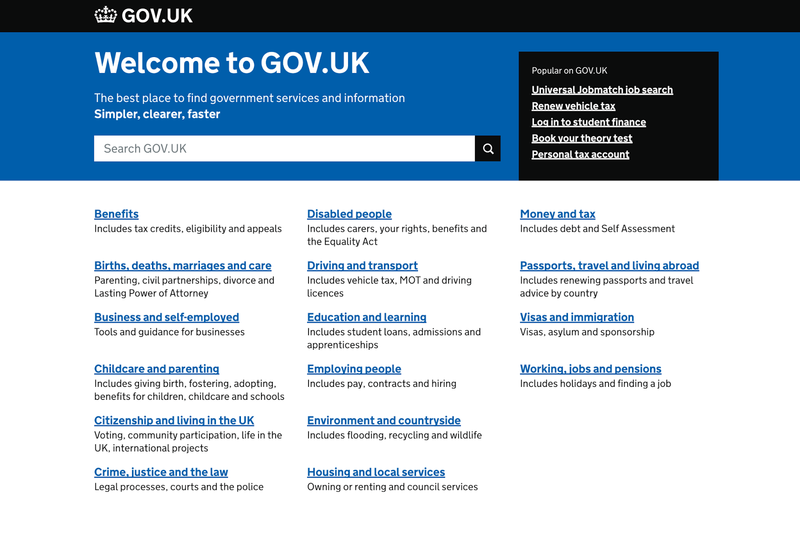 This is shown by the very existence of all of those other government websites, albeit as sub-domains on the same platform as gov.uk. That wasn't the vision that we were after and, based on the recent GDS blog post, it seems not to be the one that GDS are after either. But we had around 7 years before GDS and we've had nearly 7 years since. So clearly something isn't working. My guess is that the lessons that we learned from 2002-2010 have been learned again from 2010-2017. Sure, some new lessons will have been learned, but they will be largely the same - many of the new lessons will have been technology and methodology related I suspect. Despite everything, it all looks the same and that, when poking behind the front page, all that's revealed is more design changes - bigger fonts, simpler questions and cleaner lines. The real mystery, though, is where are the transactions? The new ones I mean, not the ones that were online a decade ago. (1) Single platform and transactions - is at least partly done, but transactions have advanced little in a decade. 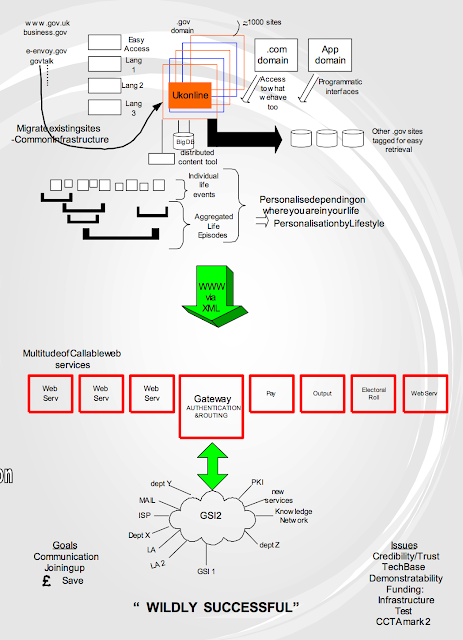 (2) Single domain - looks initially to be a success (and one that I do not underestimate the huge effort it's taken and that it continues to take), but there isn't much else in the way of shared web services (I'll be coming on to Verify and other common platform technologies soon). (3) User driven and transparent / Kill or cure - I'm going to score as strong effort, but not nearly enough of an advance on what was done before. We have a huge amount of content piled on a single technology platform. Disentangling it and ensuring that there's only one place to find the most relevant content on any given topic is not well advanced. If you're a business, things are even more confusing. And if you're a sole trader, for instance, who hops between individual and business content, you're likely more confused than ever. (4) APIs - beyond what was done years ago, I don't see much new. I would love to be pointed at examples where I'm wrong here as I think this is a crucial part of the future mission and it would be good to see successes that I've missed. (5) Flagship transactions - I'm not seeing them. The tax disc is a great example of a transaction that was started years ago and that has been successively iterated, and I don't want to undersell the monumental shift that getting rid of the disc itself, but it's an outlier. Where are the others, the ones that weren't there before 2010? The critical recommendations in Martha's report - the ones about flagship channel shift transactions, creating APIs (other than in HMRC, most of which was completed in 2000-2004) and "government services wherever you are" are still adrift. Martha's goal of "enabling all government transactions to be carried out via digital channels by 2015" seems as far away as it was when, in 2001, the then Prime Minister, Tony Blair, exhorted us to put joined up, citizen-focused services online by the end of 2005. And now we have a Transformation Strategy that promises it will all be done by 2020. I'm not seeing it. Not if we follow the current approach. That sounds snarky and perhaps it is, but it's really the fundamental point of centre's digital efforts - joining up what hasn't been joined up before. Content, as has been well proven for the last 15 years, is the easy bit. Transactions are definitely the difficult bit, and they're difficult in two ways - (1) the creation of an end to end service that goes all the way from citizen possibly through intermediary (everything from PAYE provider to accountant to Citizen's Advice Bureau to me doing my mother's tax return) and (2) the rethinking of traditional policy in a way that supports government's desired outcome, meets user needs and is also deliverable. From 2001, we started putting transactions online and, for the most part, we put online what was offline. At the time, a good start, but not one that fits with current thinking and capabilities.